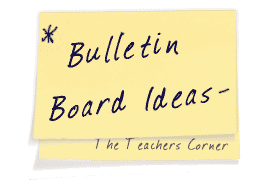 Our November Bulletin Board Ideas page will provide you with great resources for a number of monthly events, holidays and themes. Our bulletin boards will help you integrate seasonal activities into your daily curriculum. Ideas within the November bulletin board pages include resources for the following: Thanksgiving, pilgrims, Native Americans, and elections. We are always looking for new ideas! Your creativity can help other teachers. Submit your bulletin board idea and don't forget to include a photo if you have one! This indicates resources located on The Teacher's Corner. Using any type of lettering, create the title for you bulletin board. Next, you will need to create your turkey. This is very easy to do. First, find a piece of clip art of the computer, a worksheet, etc. (The size of them image does not matter, but you will want one that you can easily omit the feathers, or it is missing feathers already.) You will then make a copy of that image on an overhead transparency. Place the transparency on your overhead, tape a large piece of white butcher paper to the wall, and adjust the size of your turkey by moving the overhead projector. You can then trace the turkey onto the paper, outline with a black marker, and then color. Your turkey is then ready to be cut out and laminated! (One resource for great free clip art is the Discovery School Clip Art Gallery.) Using large pieces of construction paper, cut the shape of your feathers. You will then each student finish the statement of: "I'm Thankful For..." You can have a parent volunteer script for the students if they are younger. For older students, you may want to have them write their response on a piece of paper and have it checked for spelling prior to writing on the feather. Gobble, Gobble who is that? Mr. Turkey big and fat. Gobble, Gobble what does he say? Meet me on Thanksgiving Day. 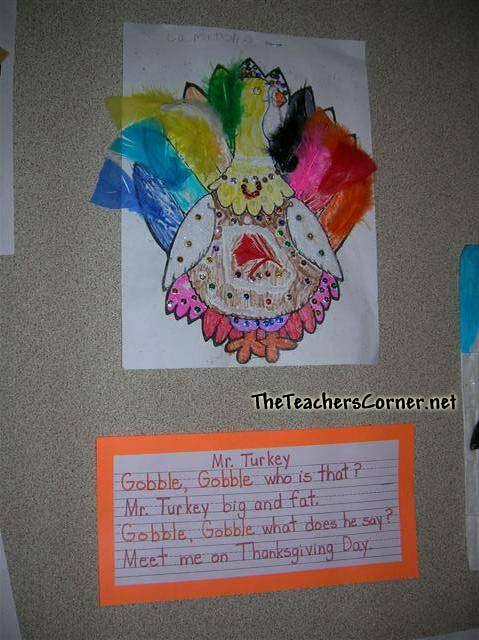 Using a simple outline of a turkey, students are able to decorate their turkeys at home with whatever type of materials they choose. These materials could be: food, fabric, pompoms, glitter, feathers, etc. I did this board as a follow up to a unit on similes and metaphors in a fifth grade class. I had the students write a short simile/metaphor poem about their favorite Thanksgiving food on a circle sized to fit inside small paper plates. I then cut out the circles and glued them to small Thanksgiving paper plates I bought at a dollar store. I used large pieces of construction paper to make place mats, which I had the children decorate with Thanksgiving stickers and stamps. I hot-glued the plates, along with plastic utensils and paper napkins and paper cups to the place mats to create individual table settings. 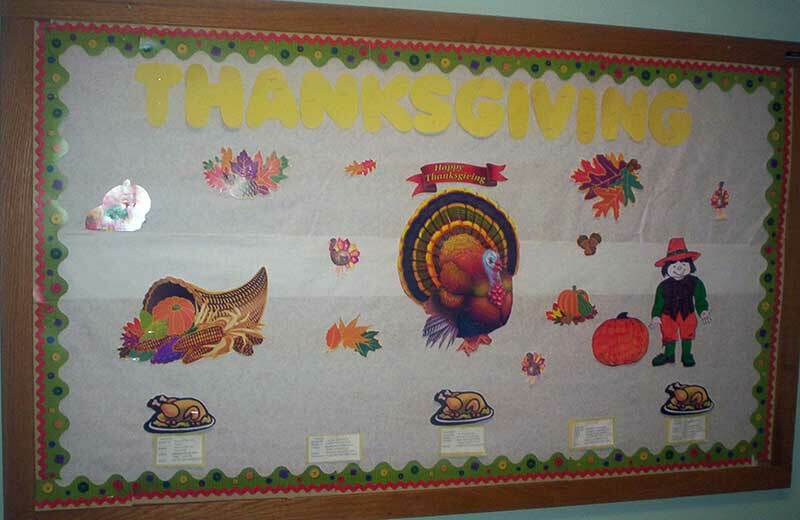 I decorated the bulletin board to look like a table by covering it with a paper Thanksgiving theme tablecloth (I let the bottom edges hang down like a real table cloth would.) Then I arranged the place mats around the edge of the bulletin board so that it looked like a real table setting. In the center I put larger paper plates with pictures of holiday food cut from magazines on them and I made a centerpiece using a picture of a cornucopia. Above the board I hung a banner made of two table runners sewn together, that read ,"Poetry is Like a Feast for the Mind." I made the lettering from felt, which I glued on with Tacky glue. 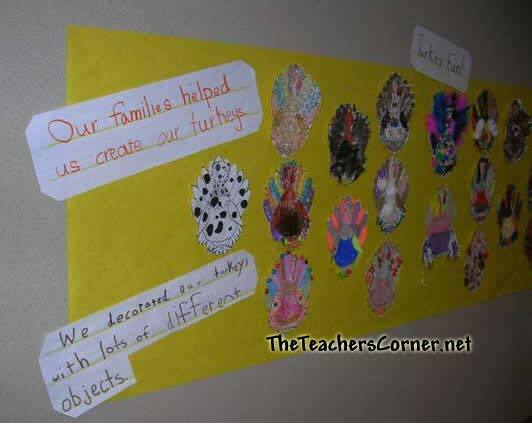 Using a simple outline of a turkey, students are able to decorate their turkeys at home with whatever type of materials they choose. These materials could be: food, fabric, pompoms, glitter, feathers, etc. You can then use an Interactive Writing lesson to have students explain what they have done. You can find example text for this in the left photograph included below. 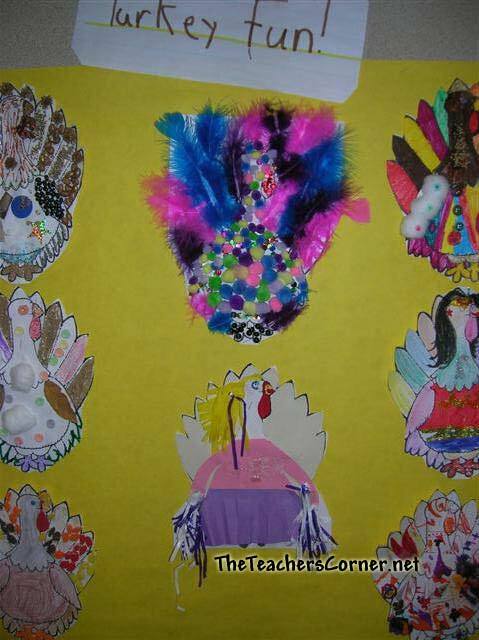 An attractive November bulletin board can be created using the Indian and Pilgrim theme and using pictures of the individual children in the class. First take a close-up picture of each child's face using a digital or regular camera. Enlarge a copy of each child's picture. Let each child then make a pilgrim or Indian construction paper person to put on the bulletin board. Add the child's own picture for the face of the pilgrim or Indian. You can either have the children do just the head of the pilgrim or Indian or do a full body. Older children may be able to do more detail on the clothing depending on the artistic ability of the group. Younger children can do the hair and headgear. Keep it simple for them. Children enjoy seeing themselves as the pilgrims and Indians on the bulletin board. I found pictures, clipart, etc. of some of the people born this month, events that happened this month, inventions developed this month, etc. Then I put the pictures on one side of the bulletin board in no particular order and the dates and one-liners on the other side of the bulletin board. Students can match the two sides with yarn that is attached to the date side of the board. Background is copies of undated calendars. 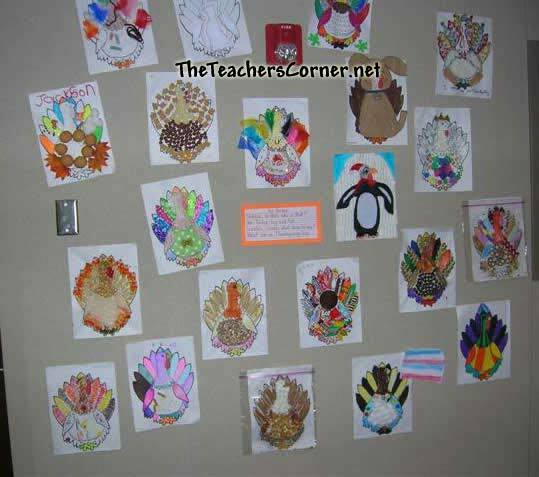 Make a large cornucopia to place on the bulletin board. Let each child select a favorite vegetable or fruit shape to be cut from construction paper. After the shape is prepared, let each child complete the following sentence on the shape. I am thankful for_____________. It will probably be necessary to help Pre-K and Kindergarten students write this out on their shape. Older students can complete the sentence without much assistance. 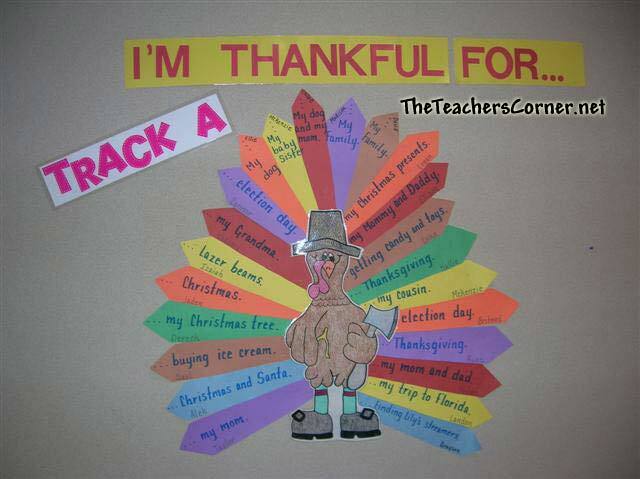 Use large construction paper letters for the caption which should say WE GIVE THANKS. Scatter colorful fall leaves around the border of the board to add additional color. Please EMAIL your favorite November Bulletin Board idea. View Subscription Plans LOST PW? Note: Subscriptions do NOT allow citation removal from puzzles and worksheets created on our site. More options available for customizing puzzles! More stock images to choose from! More images allowed per puzzle! 10 word list save slots - and access your saved lists from anywhere! All subscriptions support The Teacher's Corner! FAQ: Can I remove the "Created on The Teacher's Corner" (or similar) citation on the puzzles I create? No. That is not a benefit of our subscriptions. All citations must remain on worksheets and puzzles you create. SAFE: All subscriptions can be paid via Paypal or Stripe, so your sensitive banking information is never seen nor stored by our website. Click on Facebook and LIKE US to get up-to-date information about the release of our subscriptions and get valuable coupon codes!